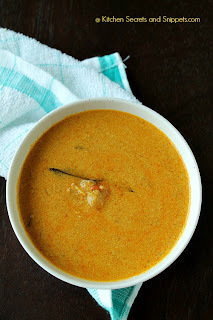 Today am gonna share one of my MIL's recipe, prawns coconut milk curry, which I just love to the extreme, yes, it tastes very delicious, y not delicious when it's cooked with full of coconut milk that is simmered to get the best taste out of it. Guys, do it once, u'll fall in love with this curry. She also makes the same curry with goat brain, prawns and cauliflower. Vegetarians may try this dish with cauliflower as I've already tasted all the versions and each one has it's own flavour. I love to have with rice but u may also have it with roti, but keep in mind to add red chilli powder if the want the curry to be spicy. For this measurement u'll get a mild curry. This time I's in a bit hurry, so clicked all the pics in a rush..Njoy ppl..
Add a pinch of salt and lemon juice to the cleaned prawns and marinate for 10 minutes. Finely slice the shallots and crush it after u chop the shallots. Slit open the green chillies. Heat the oil in a sauce pan , add the finely sliced n crushed onions to the hot oil and fry until it turns translucent. Throw in the curry leaves as well. Add the ginger garlic paste , fry well until it is fried well. Then add in the red chilli powder, turmeric powder, coriander powder and fry well for 30 secs in medium low flame, take care not to burn the masala. 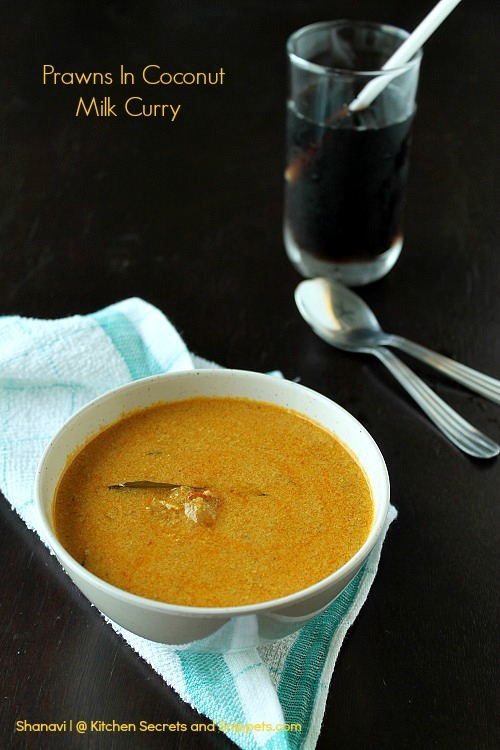 Now add in the third coconut milk to the seasoned ingredients and keep the flame as low as possible. Add the required salt as well. Simmer the gravy for 3 minutes. Later add in the second coconut milk to the gravy and combine well. As usual simmer the gravy for 5 minutes on a very low flame, at any point do not increase the heat as it will curdle the coconut milk. Later add in the first coconut milk , mix well to combine. Again simmer the curry for 6 minutes on a very low flame. By now, the curry might have been slightly thick, add the marinated prawns around this stage , combine well and let the curry simmer again for 5 minutes on a very low flame. Add the coriander leaves at last, mix well and switch off the stove. First of all, the curry has to cooked only on simmer mode, at any point of time do not raise the flame/heat, it will definitely spoil the dish and the curry will definitely curdle. This curry alone takes at the least 20 minutes to make, so plan accordingly. Do NOT DUMP ALL the 3 MILK at once, u should follow the exact method to get the perfect curry, believe me it taste so good. Though the end result might looks slightly curdle, like in the pic, it is not. This is the correct texture one should look for while making this curry. What gorgeous clicks ! Prawns are a favorite at home. This recipe luks real yum ! 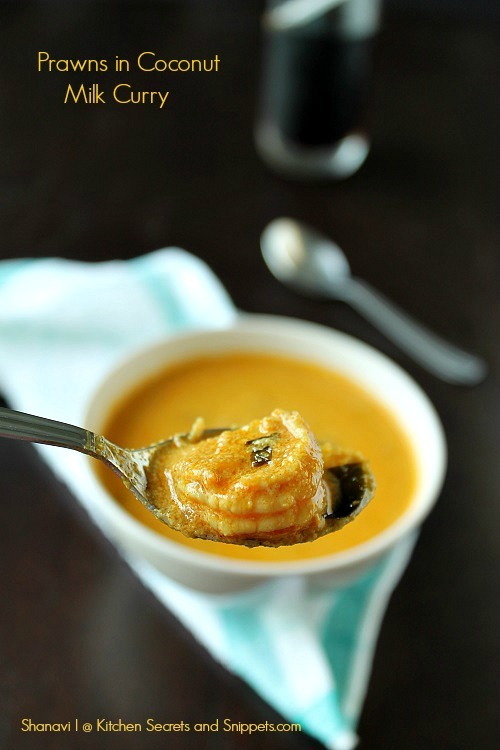 Gday Beautiful recipe and photo too! 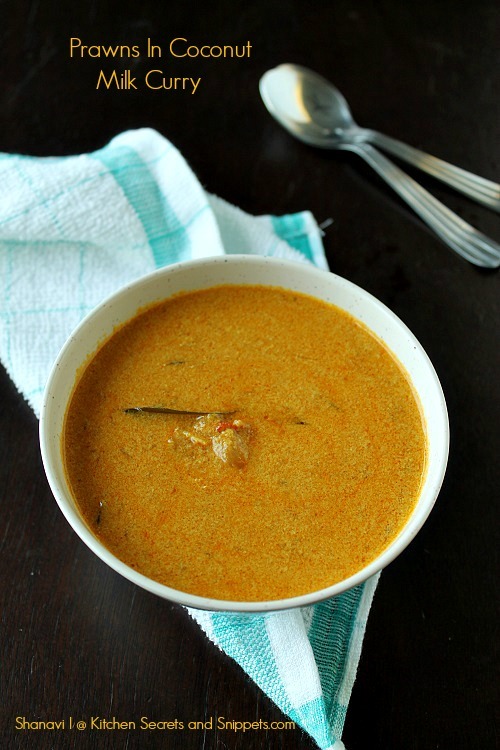 Love this curry rich and creamy and prawns what else do we need! wow! this is soo tempting, esp for the keralite in me ! lovley blog and nice recipes. do drop by my space too when u get the time. 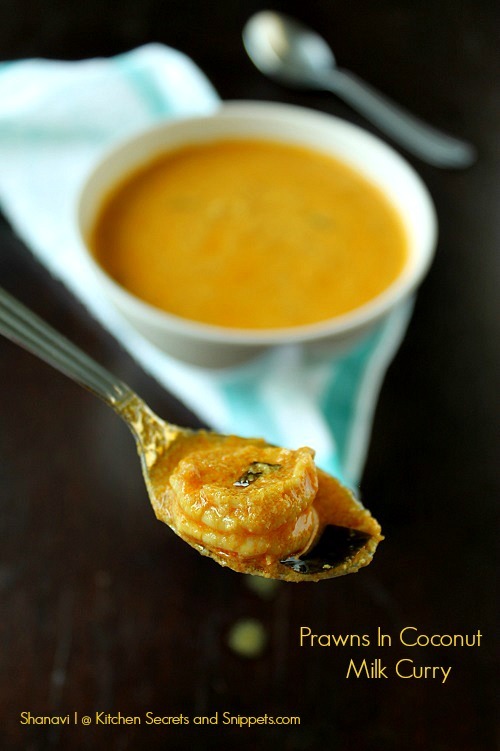 The colour of the dish itself is very pleasing and attractive,delicious prawn curry. I tried making it today and it came out fantastic... Hubby loved it. Thankyou.